By Melissa Lennig on June 13, 2018 1 Comment. This content contains affiliate links. As an Amazon Associate I earn from qualifying purchases. 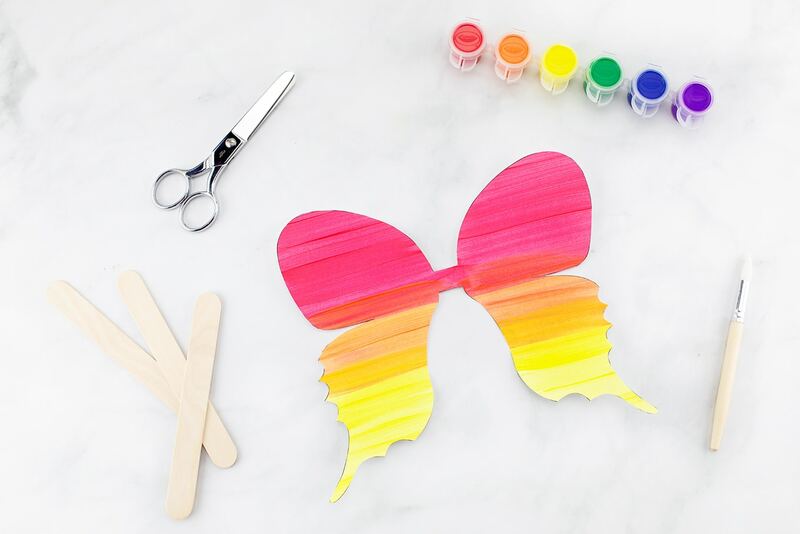 Inside: Looking for an easy and fun paper butterfly craft for kids? 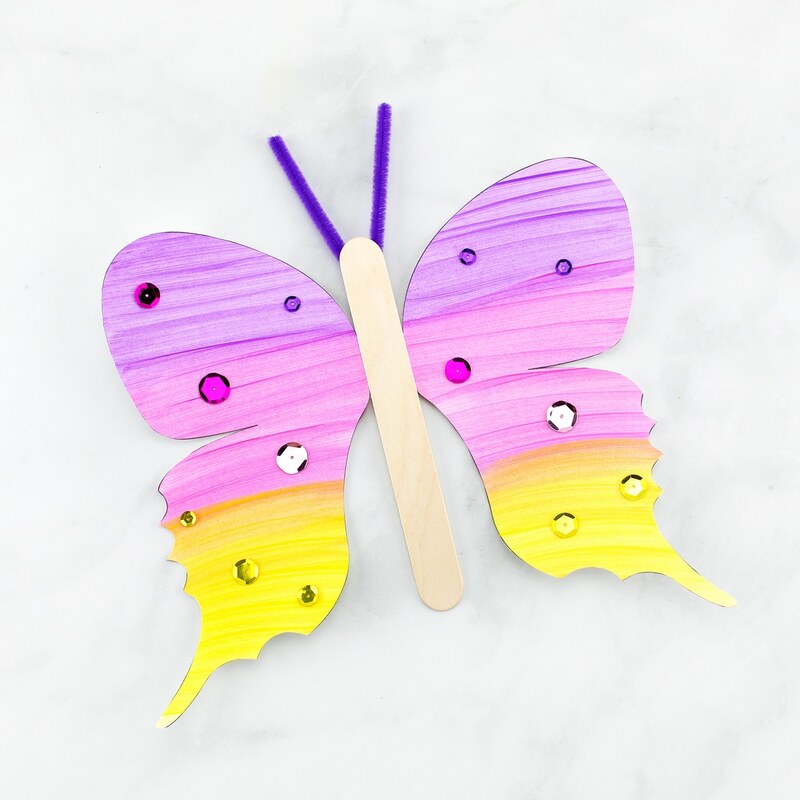 This fluttering butterfly craft includes a printable template, making it perfect for home, school, or special butterfly programs at libraries, museums, or butterfly exhibits. 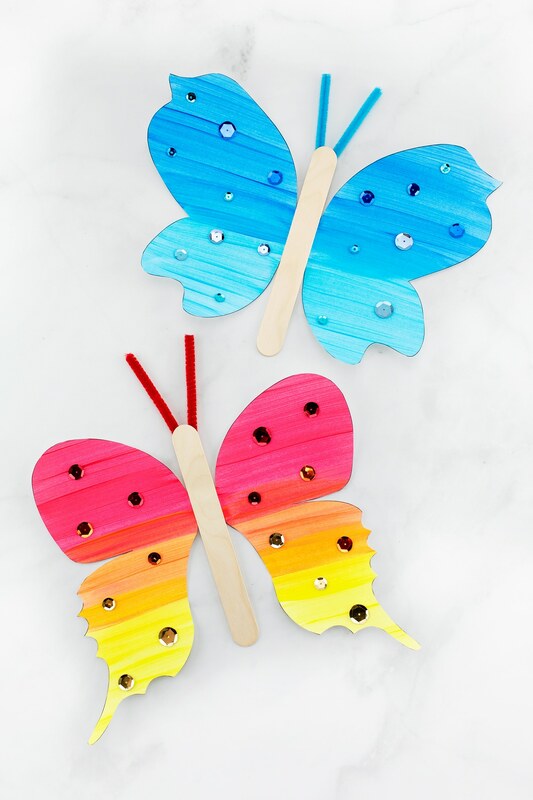 Summer is the perfect season for colorful butterfly crafts! 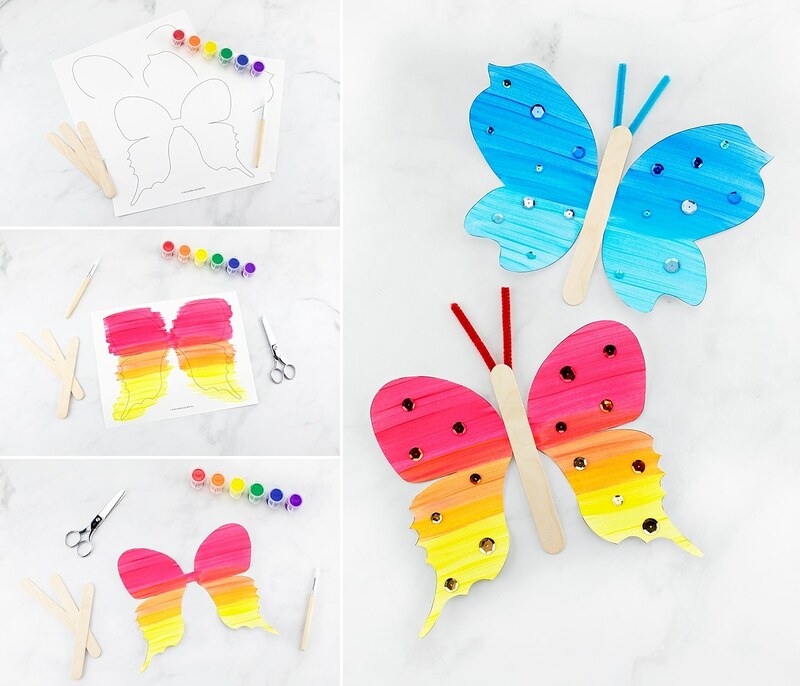 Whether kids are learning about insects, the butterfly lifecycle, colors, or simply enjoying a creative art activity at home, this fluttering butterfly craft is a fun way to extend your summer unit. 1. Print the template on white cardstock. There are 3 unique butterfly patterns included within the template. Each child will need to choose 1 pattern. 2. 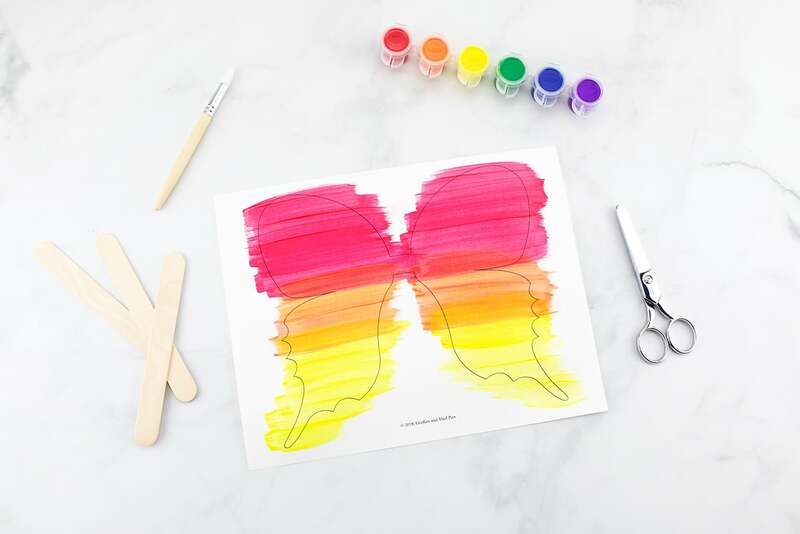 Invite your child to paint, color, and decorate their butterfly pattern. We chose to cover ours with a rainbow of washable paint, but some kids may enjoy using markers (we love this brand), crayons, Kwikstix, or stickers. 3. 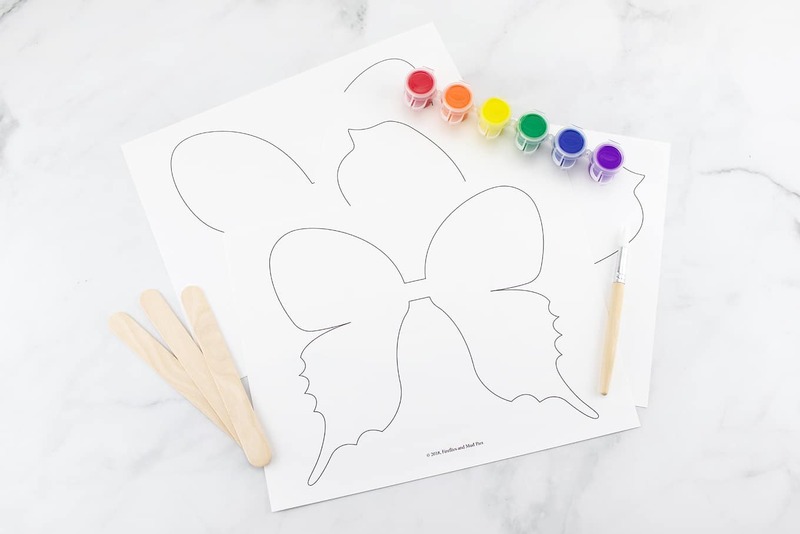 When the paint is dry, invite your child to cut out their butterfly shape. 4. Glue a craft stick to the middle of the wings. We used tacky craft glue, but hot glue definitely expedites the process! 5. 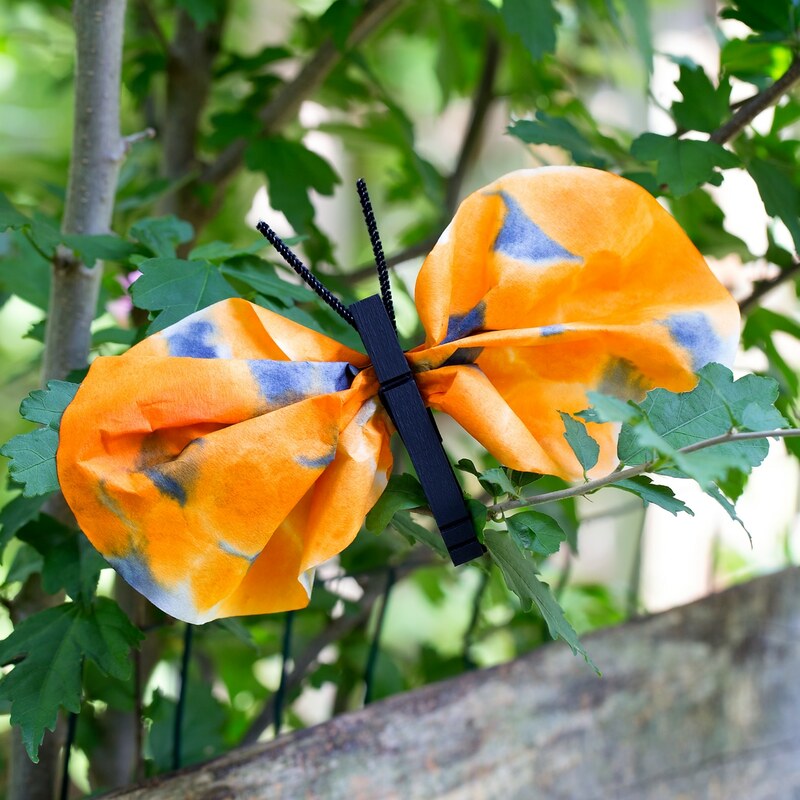 Next, cut a pipe cleaner in half, then bend your half into a v-shape to create antennae for the butterfly. 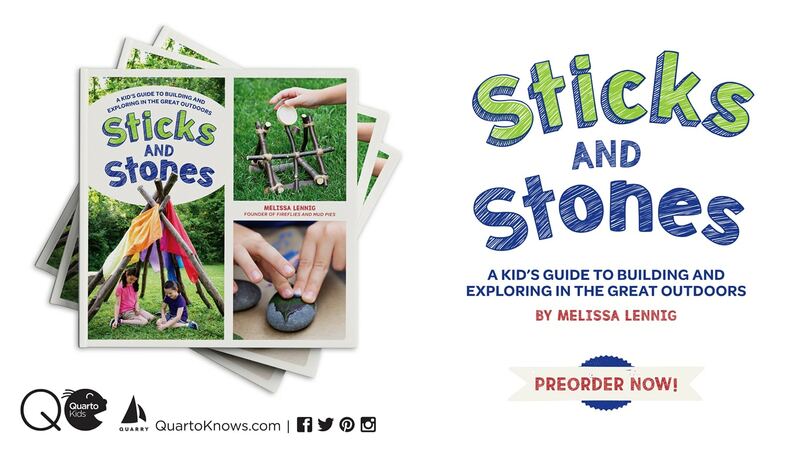 Help your child hot glue the antennae to the back of the wide craft stick. 6. If desired, glue sequins or glitter to the butterfly’s wings. I just love the look of a few sparkly sequins on the wings of these butterflies! 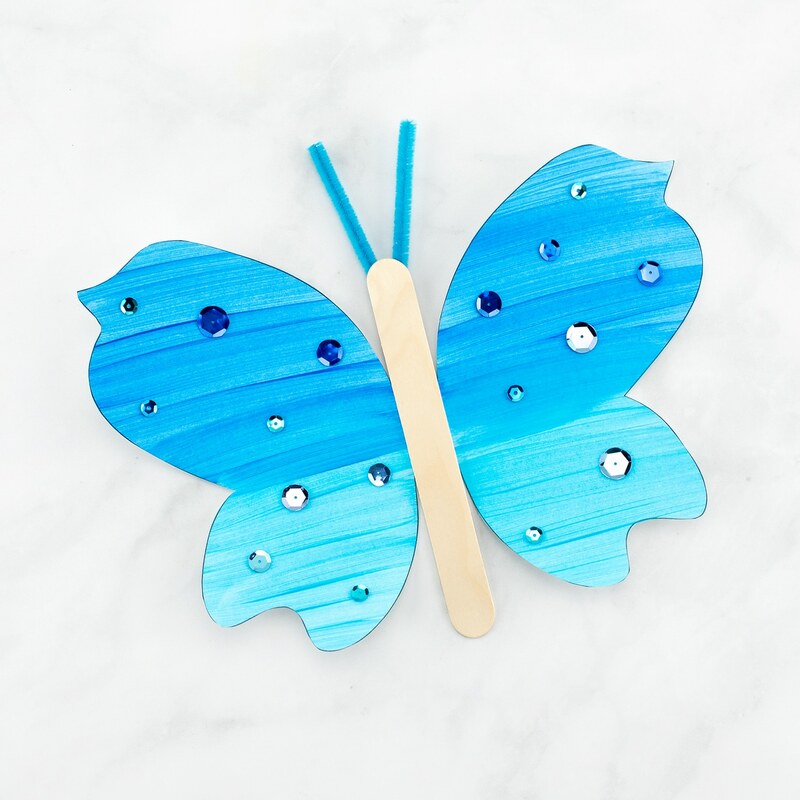 To make the butterfly flutter its wings, grasp the bottom of the popsicle stick, then gently wave the butterfly up and down until the wings are moving. Bonus? 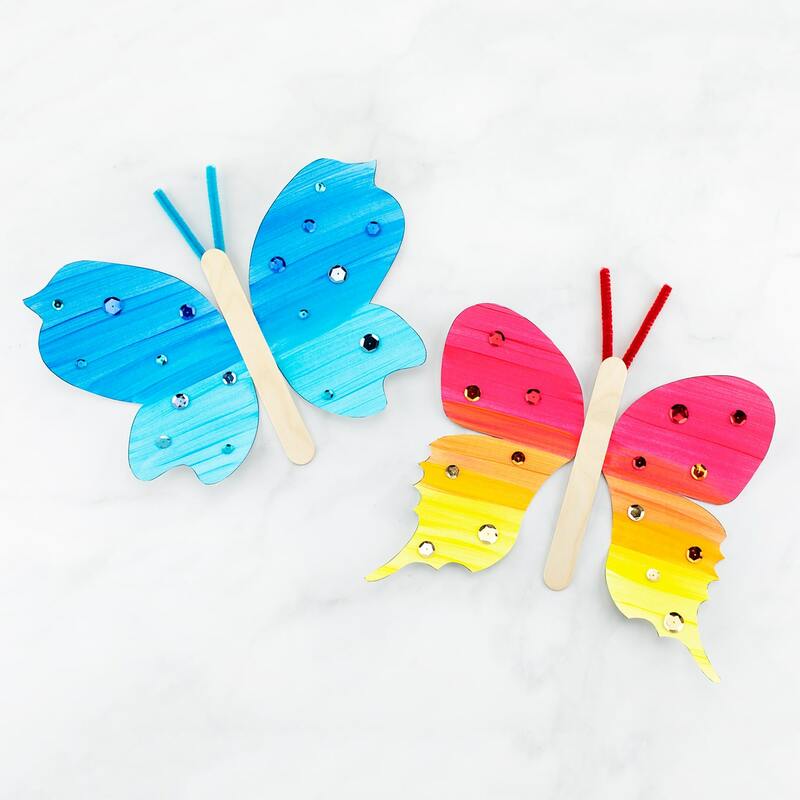 This butterfly craft also flutters without the craft stick! 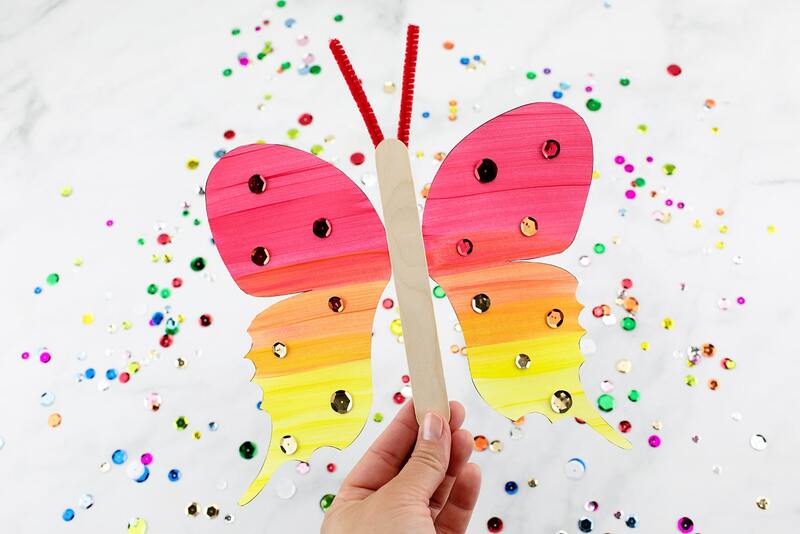 To make an easy butterfly puppet, simply pinch the template between your middle and index fingers, then move your hand up and down. 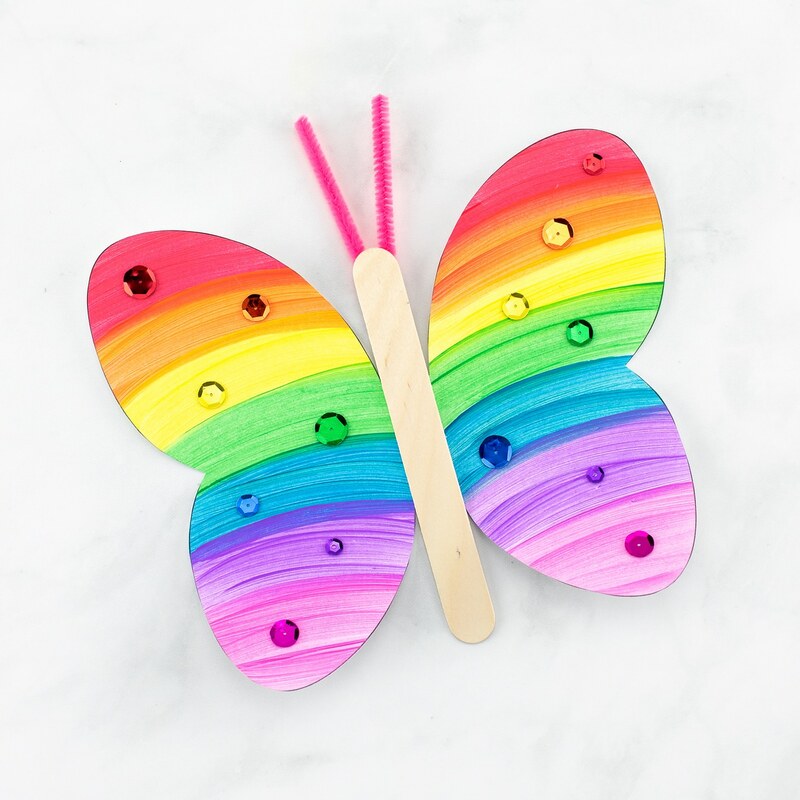 This technique is perfect for large groups of kids who need a butterfly puppet for a song, story, or performance at school, daycare, library storytime, or camp. 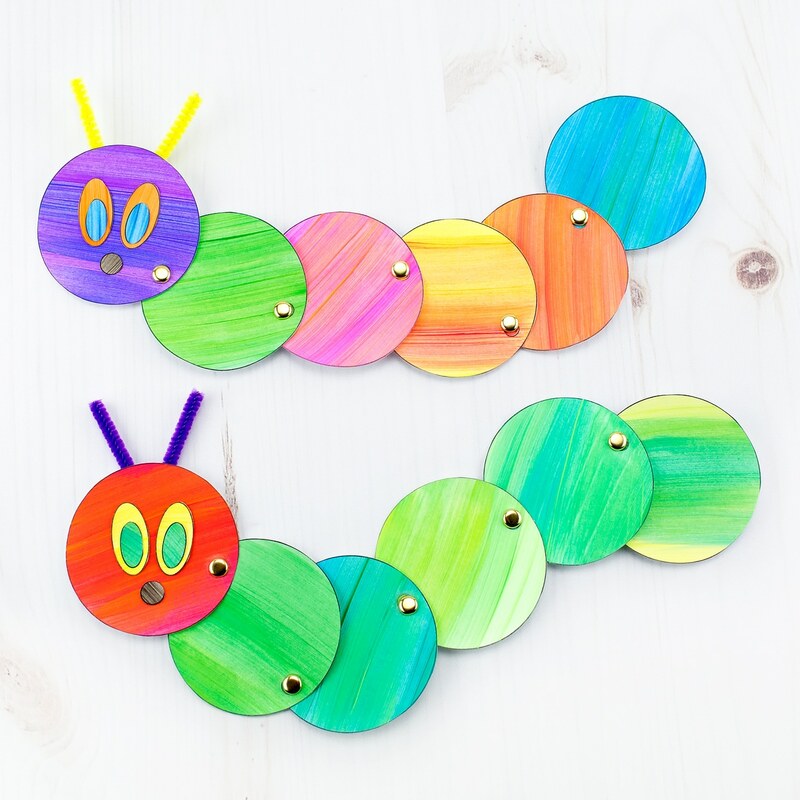 Click the images below to view more colorful butterfly and caterpillar crafts for kids.